- We booked flights, trains, and hostels for our eleven day trip through Europe! AHHHHHH!!! We will be in London for three days, Amsterdam for two, Belgium for two, and Paris for three. There's been a lot - I repeat, a lot - of thought and planning over the last two months for this, and we spent a couple nights this last week finally booking it all. I'm so incredibly excited (and sad, because I can hear my bank account in Canada sobbing from all the way over here haha). But mostly, just really, really excited. - Sometimes it seems that there are more Brazilian people in Ireland, then Irish people (at least in Riverwalk, which you'll recall is my place of accommodation). Hence, on Wednesday, there was Brazilian Day at my school. There was stuff during the day, and then that night, there was a Carnival (read: party). I love all my Brazilian friends, but they can be kind of crazy, so it made for an entertaining night. Again, also with the going out on a weekday - strange. - Friday, we went to a football game. Which is actually a soccer game haha. We bundled ourselves up so much that we all looked like the Michelin Man, and then walked to the stadium to watch the Waterford soccer team play against the team from Athlone. After finally figuring out which team we were rooting for, it was a pretty fun night. Waterford scored in the last thirty seconds of overtime, which was awesome - the whole stadium went crazy. I also realized that night that kids under the age of ten swear here more then I do..... which was slightly disturbing haha. - This weekend, we changed it up, and didn't do anything particularly exciting. We're finding out we've exhausted most of our travel options by bus now, so to get anywhere else cool we would need to rent a car. That'll happen one day I guess, but that day was not this weekend. 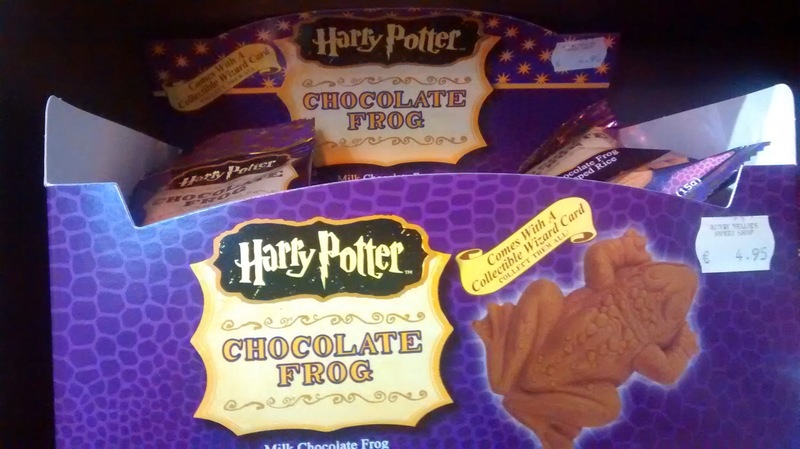 We went to this sweet shop (that's literally what it was called), in Galway, and found chocolate frogs! I thought it was pretty cool. This is a much better limerick then the one we wrote. 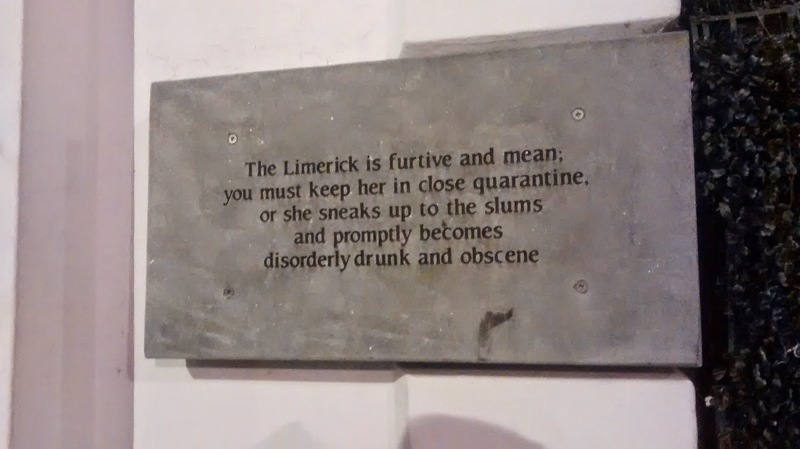 We found this in Limerick in the middle of the city, and I loved it so much I took a picture. 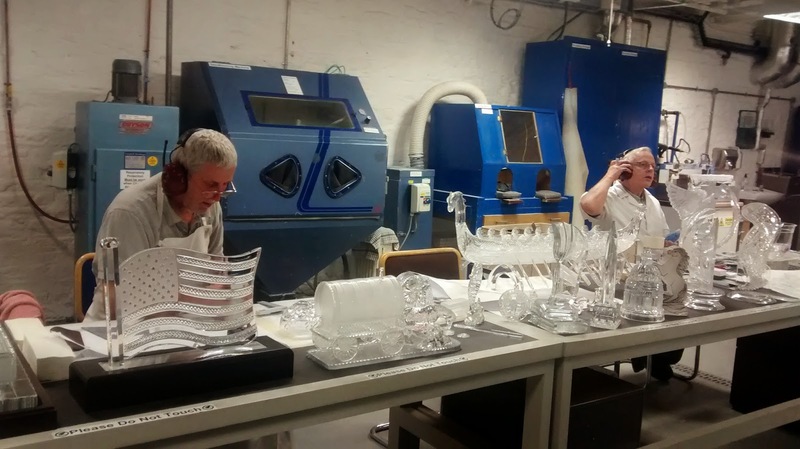 I said last week, I found it awkward to watch all the people working at Waterford Crystal, but I pushed past it and took a picture of them anyway. I believe this was the engraving stage of the process. Look closely, for this is a rare of picture of...... a sunny day in Waterford! hahaha. 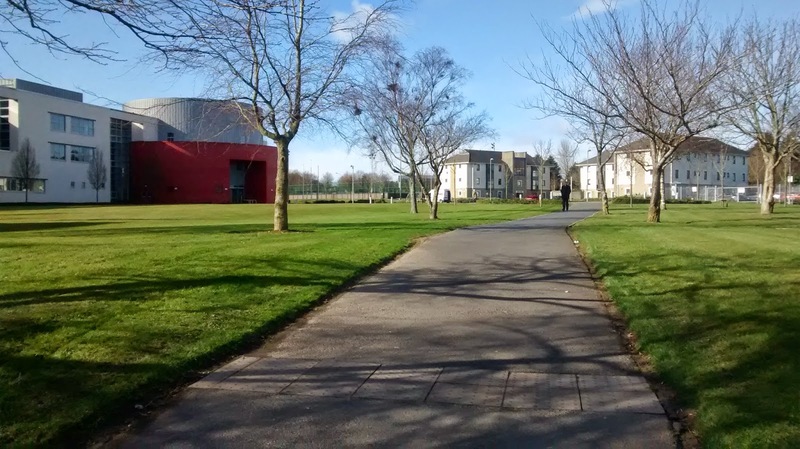 This is part of the university. Most of my classes are in that red building. Which is ironic, seeing as the health science building is actually on the opposite side of the campus, and the red building is actually the tourism building. Ireland just doesn't make sense sometimes.